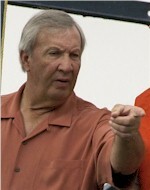 Pat Dye, right, coached at East Carolina from 1974-79, compiling the highest winning percentage among coaches in ECU's modern era. Below: Dye was featured in the 2004 Bonesville Magazine. In corporate America, it is called the "Dead Moose." It’s that moment where something is so amiss or so out of place and yet, despite its obviousness, no one addresses it. It just kind of sits there in the middle of the room and everyone talks around it. It is Hall of Fame time again at East Carolina University and there is a big, whoppin’ dead moose sitting in the room and it has been there for years… since 1989 to be precise… and no one seems to want to talk about it. It’s that big, gaping, obvious hole in the Hall of Fame Gallery over in the Ward Sports Medicine Building where Pat Dye’s photo should be hanging. See, 1989 was the year that, technically, the former Pirate coach became eligible. Inexplicably, however, years continue to roll off the calendar without his induction. It is almost unbelievable that Dye has not yet been inducted. I know, I know… there are the questions about skating around some NCAA rules near the end of his tenure as the head football coach at Auburn University. Okay, maybe that lives up to the exclusion criteria for the Hall, saying that a candidate cannot bring shame to the university — though I have yet to read anything linking the allegations at Auburn to East Carolina. I contend Dye's affiliation and accomplishments at Auburn only intensify what he did as a Pirate. Consider this: If he brought so much shame to football, why is he still held in such high esteem at Auburn, the school he supposedly besmirched? Ironically, Dye is actually on the ballot this year for inclusion into the National Football Foundation's College Football Hall of Fame. Comparatively speaking — and I am a huge Ed Emory fan — Big Ed's departure from ECU was followed by a swirl of fuzzy rumors about NCAA issues. Yet Emory is in the Hall — and deservedly so in my opinion. Imagine what it must look like from the outside. How does one who is an ECU fan honestly explain why Dye is not in the ECU Hall of Fame already? I seriously doubt that college football fans would buy the NCAA allegations thing as being the determining factor against having Dye in the Hall. From an ECU historic perspective, Dye has a clear place among the coaches who are considered benchmarks. While Jack Boone is synonymous with the earliest beginnings of the East Carolina program; and Clarence Stasavich is credited for marking the moment when the Pirates became serious about being a big-time program; and while Ed Emory is credited with ushering in the big-time schedules that would follow; and while Steve Logan is credited with taking the Pirates into the modern era of glamour ball, with regular television and bowl appearances... Patrick Fain Dye authored that exhilarating chapter in ECU lore when the Pirates simply weren’t going to take it any longer from the over-funded, over-hyped schools in the Triangle. Further, consider simply how hard it is to get around Dye’s numbers. The man was 48-18-1 in his six seasons at ECU. • Stasavich coached eight seasons and his record was 50-27-4. • Boone coached ten seasons and his record was 48-45-4. • Emory coached five seasons and his record was 26-29. • Logan coached 11 seasons and his record was 69-56. In ECU's modern era of football, Dye was the Pirates' most statistically successful coach — by a country mile. Stasavich, Boone, and Emory are already in, and barring Mike Hamrick returning to ECU, Logan will certainly be enshrined circa 2012. The dead moose is growing. What Dye did at Auburn, posting another gaudy record of 99-39-4, only adds to the ECU story and gives even more reason for his inclusion in the Hall of Fame. Though Dye left abruptly after he determined that he could no longer work with then-chancellor Thomas Brewer, who according to Dye decided he knew more about football than the coaching staff, the coach left a winner in place. While I am no expert on ECU football history and am the first to admit that I clearly don’t what reasoning is cited by those people who have been fighting to keep Dye out of the Hall, I certainly know a dead moose when I see one in a room.